Last night, my daughter choked on a lifesaver. Clumped in a crowded school hallway in the midst of the annual fall festival, while I wrangled her and her brother and her daddy wrangled the fishing line at the kindergarten booth, she screamed and gasped and retched. And I had no idea what to do. I had no idea what was happening. She could breathe–because lifesavers have holes, hence their name–but when she bent over and heaved and her face turned purple with the effort, my heart crippled with the fear. Then up came that little red circle of obstruction (along with her dinner). She cried. I cried. We got her some water and a quiet place and within half an hour, she was running around the cake walk with her best friend and eating cotton candy. I, on the other hand, sat watching her and shaking. The ripplings of fear still worked their way from my soul. We sing the song in church,. “You are peace, you are peace, when my fear is crippling.” And for a long time, I couldn’t work the words past the lump in my throat and the vice around my heart. Fear has lodged itself deep, deep into my being and learning to trust, learning to believe, learning to loosen its grip is my everyday struggle. 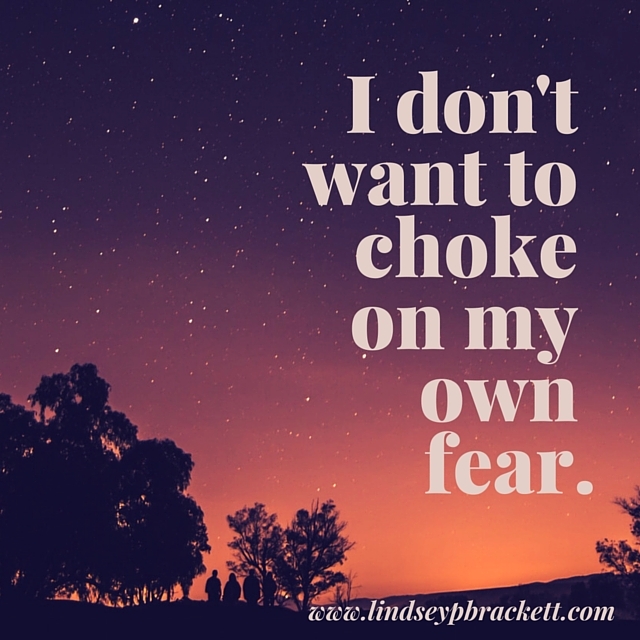 There are times when I choke daily on my own fears. Of failure. Inadequacy. Inauthenticity. Being unloved. Being unwanted. Being unequipped. Of the unexpected and of the unknown. But when the Lord gives the promise–like he gave Moses as the Israelites wandered the desert–he tells us not to fear. He gave the Israelites a land flowing with milk and honey. But it was a a land full of giants and walled cities. So they remained trapped by their fear for forty long years. Maybe some fears are like that lifesaver with a hole for precious breath and a lesson of patience. Some fears do, indeed, keep us safe. But, I’m thirty-five years old. I have a beautiful life full of promise. A life I no longer want to be crippled and trapped by the fear that if I trust, I might lose everything. Because if I don’t live the life I’m given, I’ve already lost. What do you fear? What are you looking for in reading this 31 days series?